Is your bedroom stuffy at night and keeping you awake? Maybe your room is huge and you just can not keep it cool. Choosing the right ceiling fan for a bedroom can seem like a daunting task, but it doesn’t have to leave you dizzy. Some of the first things to consider are room size, what the fan will be used for, and what style you want. Obviously sleep is an important function. But does it matter if your room is hot and stuffy? It actually does matter quite a bit! At night when you put your head on your pillow and start to drift off to sleep, your core temperature drops. This drop in temperature is signaling to your brain that it is time to shut down and get some Z’s. So what happens when you can’t get cool? It is harder to get the deep restful sleep needed to be healthy and productive. So it’s important to keep cool at night, but is sleeping in the heat really that bad? Absolutely! Without the drop in your core temperature you are less likely to be able to fall asleep and everyone is a big fan of sleep. Even in colder months a drop in body temperature at night is necessary to get the best possible sleep. The science of keeping you cool can actually be pretty interesting and helpful when selecting a ceiling fan. CPM or cubic feet per minute is how much air a fan can circulate. The more air that can circulate, the cooler you will be and the easier it will be intice a visit from the sand man. Are you a night sweater? A cool breeze on sweaty skin creates a cooling effect called evaporation (but I am sure you remember that from high school science class). Not only can a ceiling fan cool your body down in preparation for a great night sleep, it can also keep your sheets dry and sweat free. The cool breeze from a ceiling fan is probably the last thing on your mind in winter months. Houses and rooms can get stuffy during cold months too. Did you know they make fans that run in reverse? By running a fan in reverse or clockwise during colder months, warm air is pushed down. Because of the angle of the ceiling fan blades you won’t even feel the air flow if the fan is kept on low. Though almost all fans have this feature, it is still important to double check, especially if you live in a climate that gets chilly in the winter months. Hot air rises and cold air sinks; knowing this is key to saving money when using a ceiling fan year round. In the hotter months use a ceiling fan counter-clockwise to push more cold air down. When it starts to cool down, don’t shut off your fans, put the fans in reverse on the lowest setting. By spinning the blades clockwise, cold air is pulled up and the warmer air is lowered. In all seasons, with the aid of a good ceiling fan, you can adjust your thermostat a few degrees. Those few degrees will translate to big savings over the course of the year. Which Blade Length is Best? Depending on the size of the room, the necessary blade length can be determined. Blade lengths for ceiling fans vary between less than 36 inches to over 66. Take into account the size of your bedroom when selecting a fan blade size. Generally very small rooms will need a blade length of 32 inches or less. Medium sized rooms fall somewhere between 40 and 50 inches. Large bedrooms typically work best with fan blades that are over 50 inches. Ceiling fans come in a wide variety of styles and sizes to fit any taste. If lighting is an important factor, then selecting one with a built in lighting fixture or adding on a lighting kit can serve dual purposes; creating ambiance while keeping you cool. 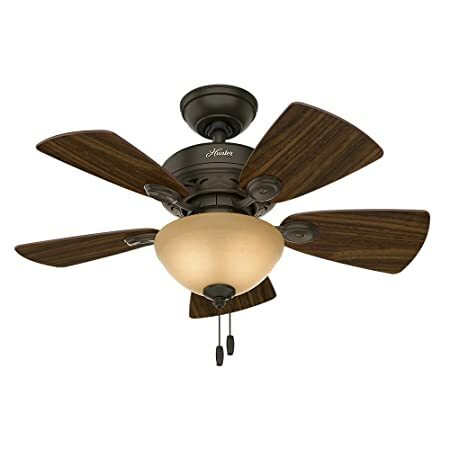 Ceiling fans are offered in industrial, modern, traditional, and many other styles in most blade lengths. It won’t be a difficult task finding your perfect ceiling fan in the length needed for your bedroom. There are even weather-proof options for sleeping under the stars. Should I Install My Own Ceiling Fan? Are you a do-it-yourselfer or do you prefer hiring an experienced professional? When looking at all the options while selecting a new fan don’t forget to keep your chin up, literally. Check out your bedroom ceiling. Do you have cathedral or vaulted ceilings? You may need to purchase a downrod kit if one is not included in your fan of choice. 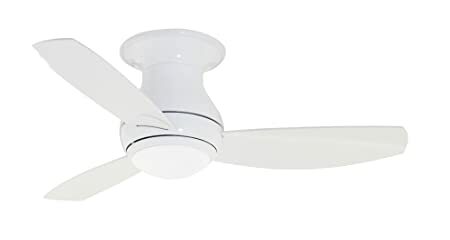 The optimal positioning for most ceiling fans is with the blades approximately 12 inches from the ceiling and about 8 feet away from the floor, but be sure to read the exact manufacturer's specifications. Using these guidelines can help you determine the type of fan you need and if you want to do your own installation or hire a professional. 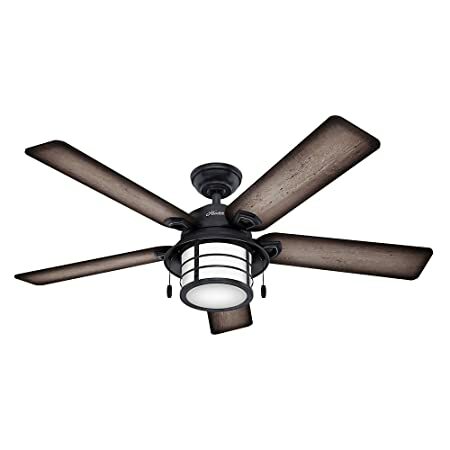 This ceiling fan features a stylish brushed nickel finished fixture with an industrial feel. The Westinghouse packs a lot of bang for your buck. If industrial is the style you are after, this 5 speed fan is an excellent choice. With fan blades 56 inches long, this fan boosts airflow up to 6254 cubic feet per minute, which is great for maximizing airflow in a small or medium bedroom or studio with high ceilings. This model includes a 12 inch downrod for installation and a 15 year motor warranty. Being one of the more budget friendly bedroom ceiling fan options, lighting is not included or offered in this model. The Westinghouse Industrial is a great choice if you’re in need of a powerful fan, especially if you already have existing bedroom lighting or it is not one of your requirements. The motor on this fan is not reversible, so it would be best for hot climates with warm winter months. A more traditional choice, the Hunter Builder Deluxe features 34 inch blades. One of the cooler features of this fan is the dust resistant coating on the fan blades, making cleaning a breeze. The 52090 can be installed flush against the ceiling, using a downrod (not included), or at an angle, which is great for a small room and nearly any ceiling height. Able to push air at 3516 cubic feet per minute, this fan makes a great addition to small to medium sized rooms. The main lighting fixture is included in this fan and will need two 60 Watt candelabra incandescent bulbs. If you are looking to add an ambient lighting source while keeping cool, this fan is an excellent choice. This motor in this model has 3 speeds, will run in reverse, and has a lifetime guarantee; just one less thing to worry about when selecting your new bedroom fan. If you have angled ceilings or are confused about installation, this fan has a variety of mounting options. It can be installed flush mounted, using a downrod (included), and on an angled ceiling. Hunter ceiling fans are known to be one of the more versatile models when it comes to installation. The Hunter Key Biscayne is both functional (with airflow up to 6239 CPM) while being very aesthetically pleasing. It is like a work of art right inside your room. 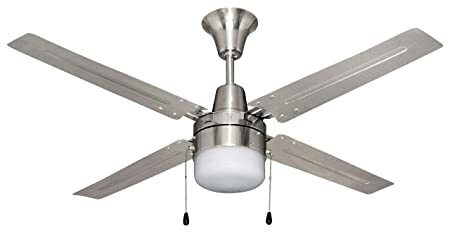 With 54 inch blades this is great for larger bedrooms and the two 14 Watt CFL bulbs are included with this model so there is no need to purchase an additional lighting kit or supplies. Practically everything you will need for the install is included in this easy on the wallet model (including a standard 3 inch downrod). The motor in this fan is covered under a lifetime warranty and runs in reverse for savings during colder months. A more modern option is the Litex ceiling fan with 48 inch blades (lighting is included). This is a downrod mount model so it would be best for medium to high ceilings and includes a 6 inch downrod and 60 watt bulb. At 6556, this fan has the highest CFM of all the various models. This will easily cool small, medium sized, and even large bedrooms. It’s compact design makes it unique, in that, you can use multiple fans of this model for larger bedrooms. This budget friendly fan gives you the most airflow per dollar and the motor is covered by a 15 year warranty, is reversible and offers 3 speeds. Coming in as one of the more pricier fans, this flush mount model has all the bells and whistles you could possibly want and is best for most medium sized rooms. The Emerson Curva ceiling fan can be used indoor and outdoor and operates at six speeds up to 4217 CPM with 44 inch blades. This model includes a handy remote control so you can increase and decrease the fan speed from the comfort of your bed. Lighting is already incorporated into this model and even includes the two halogen bulbs needed. 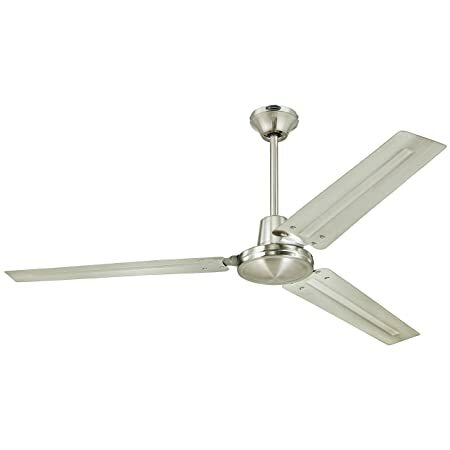 This fan is offered in three different finishes: white, bronze, and brushed steel. If you are looking for a variety of finishes to suit your style this model has something for everyone. This motor is covered by a lifetime warranty and operates in reverse for savings during the winter months. So now you have all the tools you need to select the perfect ceiling fan for your bedroom and you won’t be spinning in circles when it is time to select the right one. If you're looking for a smaller bedside fan, click here to view our guide.